Over the years, architects have come to us asking for specialized transitions for healthcare facilities. It can get complicated - these projects have a unique set of needs because of the spaces’ safety and sanitation standards, so transitions need to be as smooth and secure as possible. 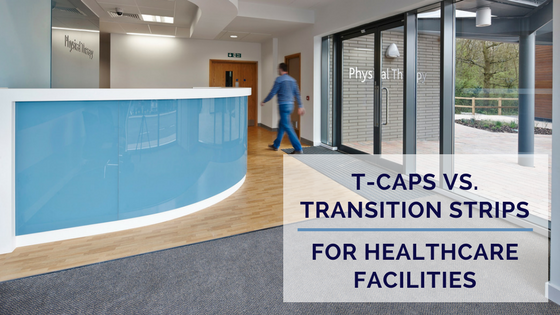 Often, the decision comes down to choosing between t-caps and transition strips. Here’s how to choose which is best for your project. Do You Really Need a Transition? The first step is to determine whether a transition is needed at all. 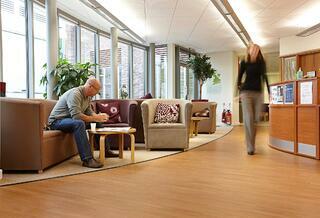 Many hospitals don’t use transition strips, running the same flooring throughout the facility. For example, we’ve visited many hospitals that have vinyl or linoleum tile in the hallway and into the patient rooms, the new space simply set apart by using a different color of flooring. If your flooring surface is the same throughout, there is no need for a transition or other joining profile. If there are different flooring materials and thicknesses, however, you’ll need to have transitions. In hospitals, it’s essential that transitions don’t inhibit movement. Accessibility is key, as is the ability for the medical team to act quickly in case of emergency. 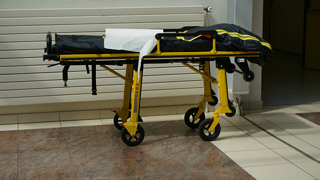 If a patient is in need of immediate attention, there’s no time for a doctor to trip over an exposed edge or for the nurse’s cart to get stuck when the flooring changes. This is why selecting the right transition is so important. If you have two similar types of flooring surfaces that you need to join together, a t-cap is often the way to go. T-caps are the lowest profile and they stay close to the ground, giving you a smooth transition for wheelchairs and gurneys to easily roll over without a bump. T-caps are often less expensive and can last longer than transition strips depending on the profile you choose. The most common t-cap profile for healthcare facilities is aluminum since it’s quite sturdy and can hold up for many years of heavy traffic. Some aluminum profiles can also be curved, which can be useful in the facility’s lobby. They’re also easy to install - the t-cap simply taps into the little area that’s left between the surfaces, then it self-adjusts to fill the space. If you have flooring of two different thicknesses, a transition strip is the most appropriate choice. A transition strip is a preventative measure, helping keep patients and doctors from tripping, and wheelchairs or walkers from getting stuck on an exposed edge. 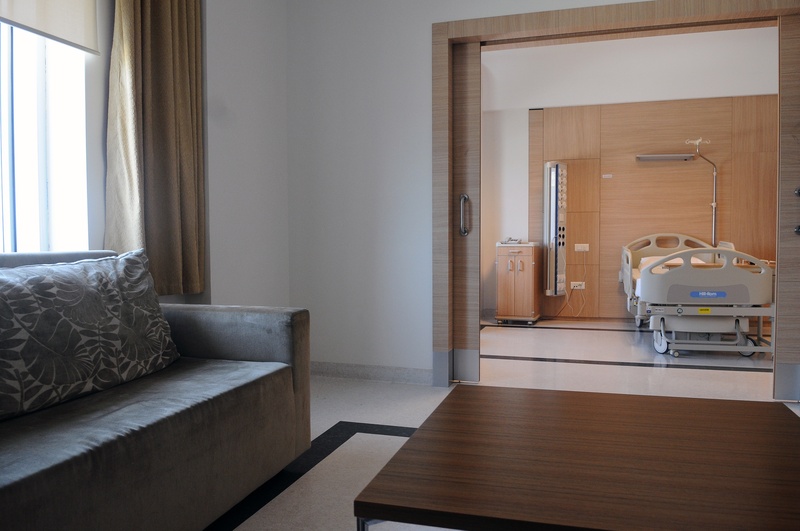 Most architects choose simple tap-down PVC transition strips for projects in hospitals. PVC transition strips come in a range of colors to match the facility’s look and are very durable, which is important in a high-traffic area that needs to be cleaned frequently. Some PVC profiles can also be curved. We’ve also seen architects specify metal, wood, and wood-effect transition strip profiles. These are more common in doctor’s offices and assisted living facilities. The best way to install transition strips for projects in the healthcare industry is with a dry adhesive tape like Opti-GripⓇ. This is the preferred installation method because it doesn’t have the toxic VOCs associated with wet glues, so it’s the safest choice for hospitals and other places with sensitive populations. At the end of the day, your decision comes down to the flooring surfaces and the look you want. If the flooring surfaces are similar, t-caps are a typically less expensive and equally durable alternative to transition strips. When the flooring is very different, a traditional transition strip is needed. Learn more about these profiles in the articles below, or check out the Gradus catalog for additional details.